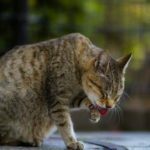 What should you do if your cat swallowed a string? Would it pass on its own or should you visit a veterinarian straight away? 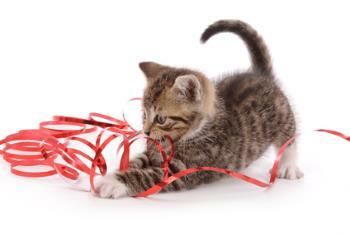 Cats often ingest different objects, such as strings (including threads with a needle), tinsel, dental floss, pieces of plastic, gift ribbons, and other non-food items. You can’t run to the vet’s every time that happens, can you? Well, actually you should. 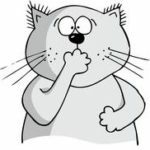 A cat swallowing a string or any other foreign body is a veterinary emergency, or at least an urgent matter. Don’t wait until tomorrow even if it’s in the middle of the night. Head to the nearest emergency veterinary clinic. Foreign body ingestion can turn lethal even within less than an hour. Will it pass through? It can pass or it can obstruct an esophagus or the intestines, which is potentially lethal. The size, slipperiness, and sturdiness of the object play a significant role. For example, tinsel or dental floss is very unlikely to pass on its own, and a thread with a needle is very, very dangerous. Even if the object could pass, it’s better if a vet confirms it. You lose nothing, compared with what you could lose. The most defining sign, of course, is that you saw your cat swallowing a non-food thing. Even if you just suspect that your cat ate it, don’t wait for signs to develop. Unlike other pets, cats rarely show any signs of illnesses. Note that the above-mentioned signs won’t all be present, and any of them can actually signal some other medical condition. This still is a good reason to visit your veterinarian right away. How will the foreign body be removed? After you get to the veterinarian’s office, it’s very likely he or she will do a series of X-rays to confirm the presence of a foreign body and to find its position or size. Surgery. Usually done with large foreign bodies obstructing or even penetrating the gastrointestinal tract. Endoscopy. This is a medical procedure where a foreign body is removed through the esophagus using a special instrument called an endoscope. Wait for the object to pass. Only a veterinarian should make such a decision, and you have to carefully follow your vet’s directions. After the foreign body is successfully removed, the animal just needs to recover from the anesthesia and can go home within hours after the operation. 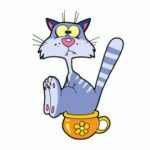 In the case of surgery, your cat will also need a calm period, and you probably will need to clean sutures and supervise your cat in the first days after the surgery. Carefully follow your vet’s directions. Find more information about caring for a cat after surgery here. 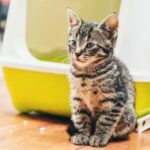 Since the foreign body ingestion can damage your cat’s internal organs, it’s very likely that the veterinarian will want a follow-up visit within a few weeks or a month. In the meantime, you should take a look around your house and see whether you keep away from your cat objects that could be swallowed. You can read more about making your house cat-safe here. What if your cat has blood in its feces?